In North Syria the great city was Antioch. Life there must have been very attractive in the second century after Christ; and, with the river traffic, the festivals, and the pleasure grove and mosaic/floored villas of the rich suburb of Daphne, it could still be gracious in the fourth. We are fortunate in know ing about conditions there from the writings of Libanius, who spent the second half of his life as professor in his native city between the years 354 and 393. The tragedy of Antioch in his time was the attrition of the 'curial' families in the city. the poor with the assurance that they were equal in the sight of God, and to some extent also helped to carry the burden of philanthropy. Libanius gives a not altogether unsympathetic picture of the curial families who still retained something of the old values in the decay of their class. Thanks to them, of course, food supply and public shows were maintained; but it was thanks to them also that education and civic amenities survived. In the Western provinces of the Empire city life gave way to feudal organisation. But in the East, where their traditions were stronger, the cities held their place in the bureaucratic system of the Byzantine Empire. In Egypt and Syria the Greek cities were extinguished with the Arab conquest. In Asia Minor they lasted longer; the diminutive realm of Trebizond held out until 1461; and Christian communities, like those of Smyrna, the Pontus and Cappadocian Caesarea, subsisted until the disaster of only 40 years ago. But, in general, the Greek city as the relic of a selfgoverning institution came to an end in Asia Minor in the generations around ad 1300 when the Turkish Ghazis broke through the Seljuk empire to establish new principalities along the coasts; and it had been in decay for a long time before that. At Ephesus, for instance, the harbour had silted up and the dwindling city had begun to take shelter at the shrine of St John the Theologian, from which it received its medieval name. It fell in ad 1304. To the Franks of the fourteenth century it was the seat of a Turkish emir from whom they desired trading concessions. The ancient glory of Ephesus was forgotten; and even the new name Ay Theologos ceased to be understood, for in our medieval sources it figures as Altoluogo, Hautelogie, Latolongo, 'altus locus' and 'alter locus', and finally descends to 'aultres lieux de Turquie'. The fortunes of the Greek cities of Asia in the Middle Ages do not count as having a place in world history - not even the fate of the former Attalid foundation of Philadelphia, whose Christian inhabitants remembered the words that 'He that Shutteth and no man can Open' had addressed to their church, and held their Door in the face of the Turks for almost a hundred years after the neighbouring cities of Asia had fallen. 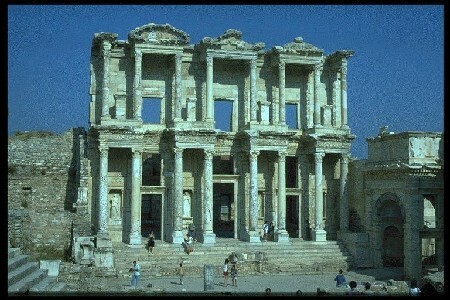 But that old Ionic invention, the Greek City, had long since fulfilled its historical role. Attenuated though it was, the Eastern Empire had survived; and the Western World was ready to receive the heritage of Greek culture and humanism.